IT was a row which culminated in the termination of a lucrative £7m contract and the resignation of a Housing Executive chairman. Today The Detail can reveal the lengths to which First Minister Peter Robinson and the DUP went to protect discredited contractors Red Sky. The Assembly’s Public Accounts Committee will today discuss a Northern Ireland Audit Office (NIAO) report which has been highly critical of the Housing Executive’s management of multi-million pound maintenance contracts. Much of the criticism centres around the Housing Executive’s handling of a £7m maintenance contract with the Red Sky group. The contract was finally terminated in July 2011 following concerns that the company had engaged in a widespread practice of overcharging and evidence of suspected fraud. But the effort the DUP, and in particular First Minister Peter Robinson, devoted to preventing the Housing Executive from cancelling the Red Sky contract can only now be fully revealed for the first time. The contents of a series of letters, emails and meetings between the NI Housing Executive (NIHE) and DUP politicians, obtained by The Detail under Freedom of Information (FoI), reveal the huge political pressure which was placed on NIHE officials in a bid to force them to overturn a decision to terminate the Red Sky contract, despite overwhelming evidence of wrongdoing. Red Sky went into voluntary administration on April 19, 2011 three months after the conclusion of a Housing Executive investigation into its maintenance contracts. The Detail can now reveal the contents of a crucial meeting between senior DUP politicians and NIHE officials which took place nine days after Red Sky went into administration. The DUP delegation, led by First Minister Peter Robinson, included east Belfast assembly members Robin Newton and Sammy Douglas. The Housing Executive was represented by then chairman Brian Rowntree, acting chief executive Stewart Cuddy and housing director John McPeake. A minute of the meeting, taken by Mr Rowntree’s secretary, records how Mr Robinson opened the discussion by claiming that the decision to terminate the Red Sky contract “reflected a sectarian bias on behalf of the Housing Executive”. Mr Robinson claimed the Housing Executive was treating Red Sky differently from other contractors and claimed unnamed politicians in west Belfast had orchestrated a campaign against the company. Mr Robinson warned the Housing Executive officials they could expect an enquiry into the decision to terminate the Red Sky after the assembly elections, which were due to take place the following month. It is unclear whether Mr Robinson was speaking in his role as First Minister or as an assembly member for east Belfast. Mr Rowntree “categorically denied” any sectarian bias or political interference against Red Sky and insisted that the decision to terminate the contract had been made entirely on commercial grounds. When Mr Robinson requested a “definitive reason” why the Red Sky contract had been terminated he was informed it was because the company had been overpaid by £340,000. Executive officials warned that the real figure could be £1.5m. Mr Robinson’s colleague Robin Newton claimed there had been a “politically inspired” campaign against Red Sky. Following the assembly elections in May 2011 The DUP’s Nelson McCausland became Social Development minister. The Detail has obtained minutes of a meeting which the new DSD minister held with Red Sky representatives on June 27. The Red Sky representatives were accompanied by a DUP delegation, again led by Peter Robinson. Despite the company being in official administration, none of the administrators, who were now legally in charge of Red Sky, were at the meeting. Three days later Mr McCausland met with Housing Executive chairman Brian Rowntree and requested that the decision to terminate the Red Sky contract be suspended for six months. 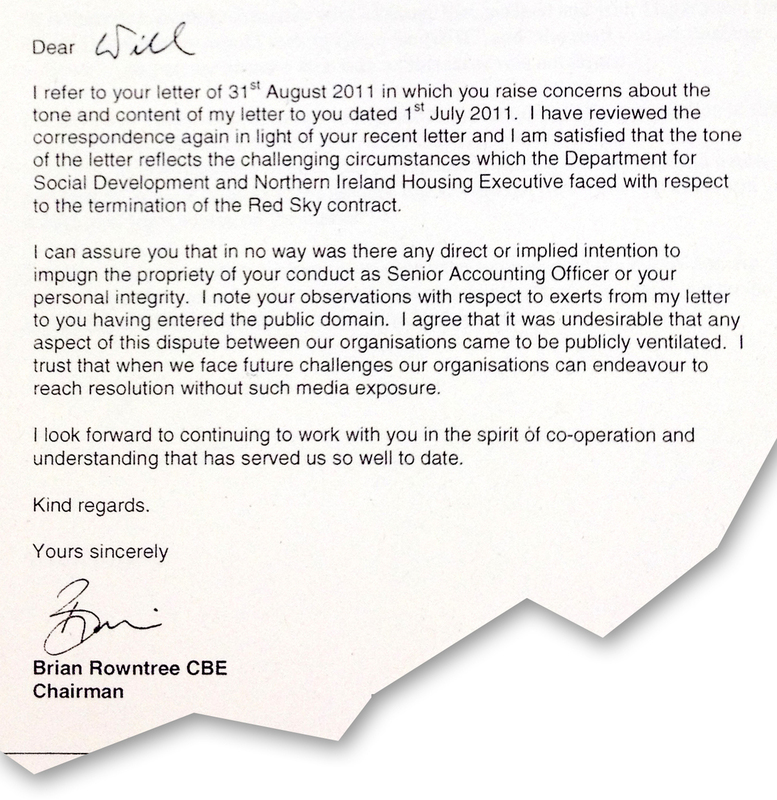 The Detail can now reveal the contents of a letter Mr Rowntree sent to DSD Permanent Secretary Will Haire on July 1 in which he registered “serious concerns and misgivings” over the way in which Mr McCausland and his department were now trying to influence the Housing Executive’s handling of the Red Sky termination. Mr Rowntree said that the Housing Executive had only decided to terminate the contract as a result of evidence of “significant overcharging” and revealed that consideration was being given to referring the matter to PSNI for possible criminal investigation in relation to suspected fraud. Mr Rowntree said it was “incomprehensible” why Mr McCausland and DSD would demand that the Housing Executive should allow the Red Sky contract to continue. “We understand that meetings have taken place with the senior management of Red Sky in administration and the Minister, First Minister and other DUP elected representatives. “We further understand that the administrators were not present. Mr Rowntree said the HIHE had “serious concerns and reservations about the road you are pushing us down” and asked that Mr McCausland and DSD “step back” to allow the executive to manage its business. Mr Rowntree expressed surprise that Mr McCausland had supported the Housing Executive’s decision to suspend the Red Sky contract in a letter to east Belfast assembly member Naomi Long in May but six weeks later was now threatening to issue a ministerial directive to force the executive to overturn its decision. He said the Housing Executive considered that any decision by Mr McCausland to issue a ministerial directive to help secure an extension for a “single discredited contractor” amounted to an “unwarranted and improper interference” in an operational matter and would result in legal action against the minister and his department. However in a reply on July 7, Mr McCausland said he was “gravely disappointed and concerned” at the manner in which the executive had dealt with his request for an extension to the Red Sky contract. Mr McCausland said he had “explicitly” requested that Mr Rowntree should put the Red Sky extension to the NIHE’s management board but expressed regret that Mr Rowntree’s correspondence had failed to deal with the issue. Mr McCausland later claimed Mr Rowntree’s letter had sounded like “a declaration of war”. Relations between DSD and the Housing Executive appeared to sour even further when DSD Permanent Secretary Will Haire responded on August 31 to Mr Rowntree request for Mr McCausland’s department to withdraw from the Red Sky affair. 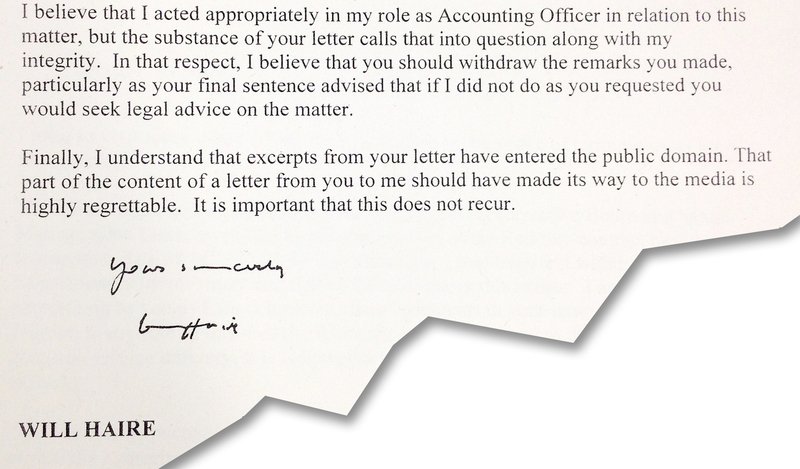 Mr Haire, who is the most senior civil servant at DSD, wrote that he was “concerned” at the content and tone of Mr Rowntree’s letter. “I believe that I acted appropriately in my role as accounting officer in relation to this matter, but the substance of your letter calls that into question along with my integrity,” he said. “I have reviewed the correspondence again in light of your recent letter and I am satisfied that the tone of the letter reflects the challenging circumstances which the Department for Social Development and Northern Ireland Housing Executive faced with respect to termination of the Red Sky contract. Mr Robinson’s warning of an enquiry into the Housing Executive got quickly underway following Mr McCausland’s appointment as minister. The report, carried out by chartered accountants ASM Howarth, was delivered to the DSD Minister in July 2012. 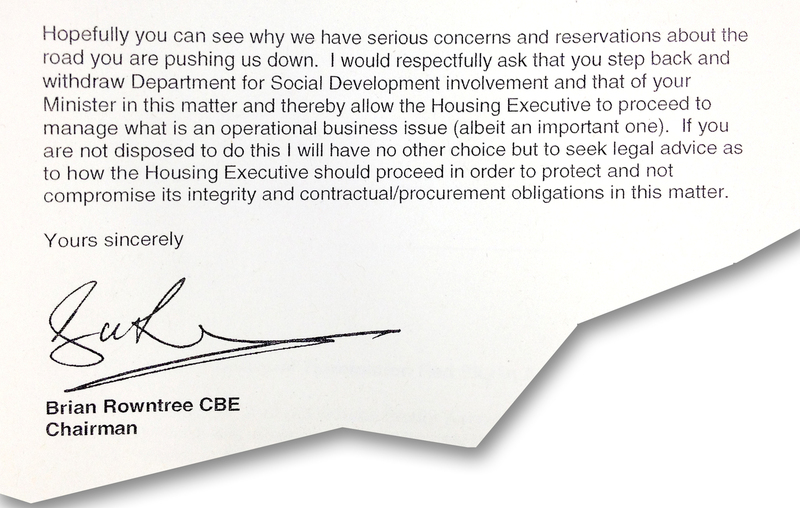 Four days before Mr McCausland delivered the report to the assembly it emerged that Mr Rowntree had resigned as chairman of the Housing Executive, citing “personal stress” and a “challenging relationship” with DSD. In an email to executive staff Mr Rowntree revealed that he had not been allowed to challenge the contents of the report by DSD. “I believe that there are imminent statements which are about to be made by the minister…relating to events and reports which neither I as chairman nor my board have had an opportunity to address,” he said. “failed to demonstrate the required response to known shortfalls” in its management of contracts. Public service union Nipsa claimed the minister had given “a clear signal of his intention” to break the Housing Executive up into different organisations, which it said was not in the best interests of tenants or staff. Mr McCausland is expected to announce a decision on the future of the Housing Executive in the near future.